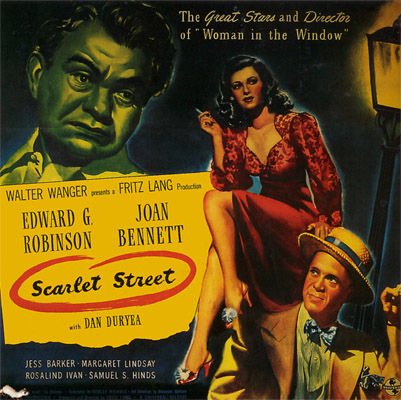 Scarlet Street is another great film-noir from Fritz Lang. We have our everyday man and noir staple Edward G. Robinson in the lead. Joan Bennett as our femme fatale and Dan Duryea as a con and thug trying to get ahead. This story starts out with our hero at a company party for his 25 years on the job. He leaves drunk and sees a beautiful women getting beat by a man. He intervenes and stops it, he walks the women home and stops to have a drink with her. He is infatuated with the much younger women and she seems to like him as well. The only problem, he’s married to a battle-ax he can no longer stand. You think you might guess the plot from here, but you would be wrong. This is one of the most intricate plots, with so many twists and turns, I can’t believe they got all this story to fit into less than 2 hours of movie. One of the surprising and shocking things of this movie is the abuse towards women, the way it is portrayed makes it look common and just part of life for the time. The couple out to get ahead is very co-dependent and I found very disturbing. This movie has no truly innocent or good characters, all are willing to do anything to get what they want. None of them want the same thing, but use each other in a way that makes for one intense movie. 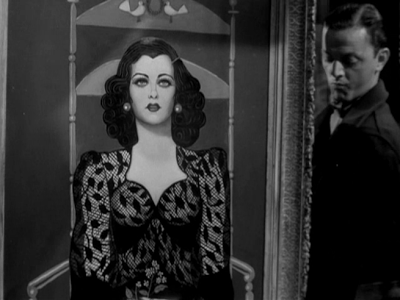 The other star of this movie is the art, it’s funny that this and my last film-noir review (See my review of Laura) have a portrait of the lead lady that is amazing. I didn’t realize this when I watched them a couple of days apart, but is a cool coincidence. The art in this film is very cool. This may be the darkest classic film noir I’ve seen thus far. There is no gangsters and guns in this movie and that might be what makes this so dark. I think this is my favorite Fritz Lang film I’ve seen so far. This isn’t a widely watched noir but it should be. This film has a 7.9 on IMDb with less than 9,000 votes, and 100% on Rotten Tomatoes but with only 13 reviews. This film did fall out of copyright protection, so make sure you watch a good version of this that isn’t to cut up and distorted. I watched it on TCM, always a reliable source for classic films.